SEPTA has teamed up with Visit Valley Forge to help promote how EASY it is to go from Center City Philadelphia to Montgomery County on SEPTA. With 49 SEPTA stations in Montgomery County, there is a stop for everyone! From Ambler to Ardmore, Norristown to Narberth, Glenside to Gulph Mills, SEPTA has you covered. So, go ahead, hop on SEPTA, and #MakeItMontco! Montgomery County is made up of a number of small, downtown areas, that help to make the county unique - many of which are adjacent to or just a short walk from a SEPTA station. We've highlighted a few of the towns below. Click the town name for more info including SEPTA service and fare info, local happenings, deals (aka Perks), and more! 🍽️ Boasting some of the best dining in Montgomery County, Ambler's walkable downtown - anchored by Ambler Station - features a wide range of restaurants, as well as theaters, shopping, and tons of events! 🛍️ Nicknamed the “Main Street of the Main Line,” Ardmore is home to some of the area's best dining, shopping, and nightlife - all steps from Ardmore Station. 🏠 A unique and vibrant community lined with bars and restaurants, Conshohocken or "Conshy" is located on the banks of the Schuylkill River, just 15 miles from Center City. The ride from Suburban Station to Conshohocken Station is just 36 minutes! ⛳️ Fort Washington is a charming and beautiful suburb of Philadelphia. In addition to preserving its history, Fort Washington is also home to some of the best golfing and gardens in the area. 🎨 One of the oldest boroughs in Montgomery County, Jenkintown is filled with history, shops, restaurants, bars, and an impressive art scene. Jenkintown-Wyncote Station is served by three Regional Rail Lines - making it so easy to get here on SEPTA! 🍽️ Lansdale is a community on the rise! Its dining scene continues to grow with award-winning restaurants dotting its main street. First Fridays are a great time to discover this hidden gem near the center of Montco. Best part? Trains stop at Lansdale Station 38 times per day! 🍺 Known for its walkable and charming downtown (which includes the train station), Narberth has everything from dining, nightlife, shopping, and family-fun entertainment. 🚶‍ Norristown is home to many diverse restaurants, has shopping in close proximity, miles of nature trails, Norristown Arts Hill district, Elmwood Park Zoo, and so much more. Norristown Train Station is adjacent to the Norristown Transportation Center offering more travel options like bus and high speed line service to get you everywhere you need to go! 🛍️ Located 25 miles northwest of Philadelphia, King of Prussia is home to the largest retail mall on the East Coast. We do not have rail service to the mall yet - but we will someday! And for now - we can still get you there or close! There are 7 Bus Routes (92, 95, 99, 123, 124, 125 & 139) that serve King of Prussia and two Regional Rail Lines (Paoli/Thorndale & Manayunk/Norristown) pass its borders and the Norristown High Speed Line skirts its edge. The nearby stops along these lines provide indirect access from where you can take a bus, car, shuttle, bike, or walk to your destinations within King of Prussia. 🌲 Featuring unparalleled history at Valley Forge National Historical Park, Valley Forge is a great place to explore! Again - this is just a small sample of the places you can go and see in Montgomery County!! 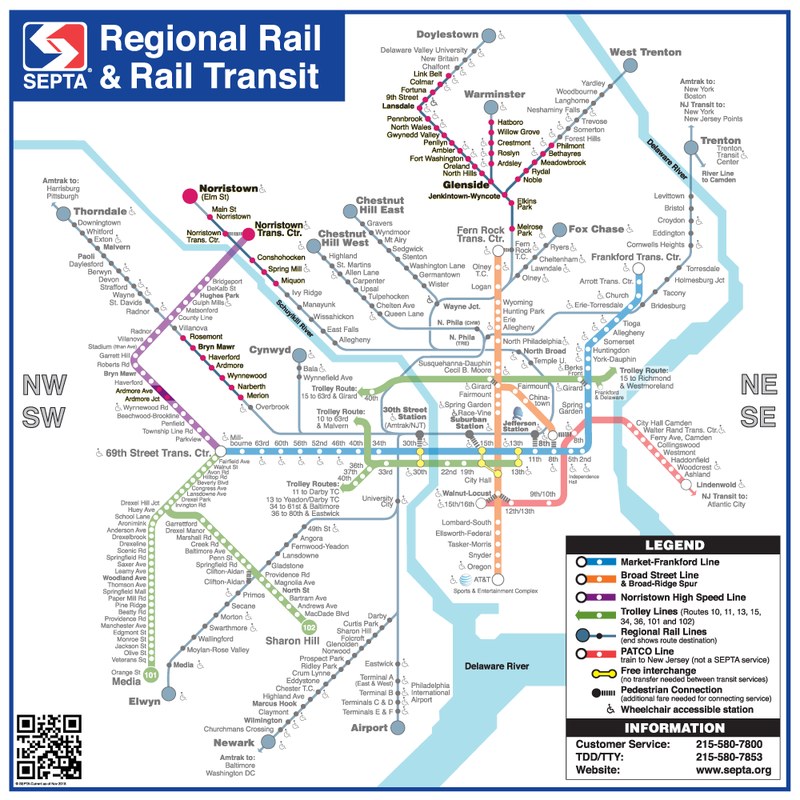 Check out the SEPTA System Map below for a "bigger" picture. The stations in pink represent each of the stations in Montgomery County. For a PDF [larger] version of the map, click here. When taking Regional Rail from Center City to Montgomery County, you can catch a train from all five Center City Stations: University City, 30th Street, Suburban Station, Jefferson Station, and Temple University Station. The best and most cost-effective option is to buy your ticket ahead of time from a SEPTA Sales Office. Tickets purchased from there will cost $5.25 and $6.75 on weekdays, and between $4.25 and $5.25 on weekends. A one-way ticket purchased from a conductor costs between $6 and $8 (depending on your zone) on weekdays and between $5 and $7 on weekends. Have a paper TransPass or a TransPass loaded on your SEPTA Key? You're in luck! You can use your TransPass on ALL SEPTA Regional Rail Lines on weekends! You can also purchase an Independence Pass for $13 (one person) or $30 (families). This allows you unlimited one-day travel on all of SEPTA. Independence Passes can be purchased beforehand at a SEPTA Sales Office, or on-board a Regional Rail Train from your Conductor. If you do opt for an Independence Pass, you can take advantage of Perks. Gypsy Blue, an inviting neighborhood restaurant and bar with 24 beers on tap, 8 wines on tap, specialty cocktails, and delicious food located in Ambler. Also in Amber is Wild Lilies Jewelry which sells trendy, chic, sophisticated, and classic earrings, necklaces, rings, bracelets, and more and Xtra 101, a fun, friendly place for women (and men) to shop for clothing and accessories, located in downtown Ambler. You can also flash your Pass (for free popcorn) at the Ambler Theater! This movie theater specializes in art & foreign films, plus kids' events & guest lecturers. Your SEPTA Pass will also get you free popcorn at the Hiway Theater in Jenkintown! From there head up the road - or tracks - to Glenside to Roberts Block Restaurant, an American dining & a solid cocktail list in a rustic-chic space located in Glenside, right next to SEPTA's Glenside's train station. We recommend you hit the Elmwood Park Zoo located in Norristown which currently maintains a collection of over 100 species primarily indigenous to the Americas. And features over 50 challenge games and zip lines that span up to 50 feet above the ground in the trees of the Zoo. But that's not all!! Make sure you check out the full list here! The Valley Forge Tourism & Convention Board is a private, non-profit membership sales and marketing organization which actively promotes the Valley Forge area and Montgomery County as a convention site and leisure visitor destination by promoting patronage of its member hotels, restaurants, attractions, and services. SEPTA is the nation’s sixth largest public transportation system and the largest in Pennsylvania with a vast network of fixed route services that include buses, trains, and trolleys. Our service operates over 2,200 square miles and transports over one million passengers in Bucks, Chester, Delaware, Montgomery, and Philadelphia counties and in Trenton and West Trenton, New Jersey, Newark and Wilmington, Delaware. SEPTA service also provides riders with access to regional, national and international travel via Amtrak, NJ Transit, the Port Authority Transit Corporation High Speed Line and airlines serving Philadelphia International Airport. For schedules, maps, fare info, and more - click here.